Practical advice on drafting or implementing A3 reports is a difficult proposition via the internet. The best people to give you advice are usually in your own company as they have specific knowledge about your unique situation, problems, and opportunities, etc. However we realize that not all companies have people who are familiar with the basic tenents of drafting or reviewing A3 reports. For those interested Prof. Sobek an Art Smalley are willing to look at a couple of A3 reports or answer a couple of questions per month as time allows. Please contact us via the About the Authors section of the website if this is something of interest to you. In return for this advice we simply ask that you will allow us to post your questions and some of the content from the A3 report on the site for learning purposes. Obviously please do not send any confidential material. Or at least sanitize the contents in such a way that other parties may view the contents without any harm. 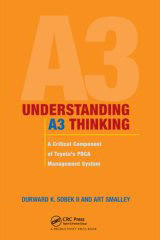 In the mean time please also visit the A3 Thinking Blog where we will be posting short articles and tips from time to time. For those interested in purchasing a copy of the book please visit the direct links below to either Productivity Press or Amazon.com.